I've been a cosplay slacker this year. If I've worn a costume, it's been the from-the-closet variety. By that I mean I didn't spend hours gluing beads on a scarf or making plastic look like metal. I just pieced outfits together (like a Hogwarts student or an Amy Pond-ish costume). I decided to take the easier, quicker path for Halloween, too. It doesn't mean I'm turning to the Dark side though. Promise. I had two costumed events for Halloween and both of them were last weekend. I waited until the day before to think about what to wear, and of course, I didn't just pick something out of my costume closet (having a whole coat closet in California is unnecessary). That would have been too easy. Instead, I ran around like a crazy person on Saturday afternoon searching for new costume pieces for Death from The Sandman comics for my Sunday night event. While I was out, I found a perfect solution for the Saturday night party, too. One of my favorite characters in comics so far is Death. I'm not sure what made me think of her Friday afternoon, but she crossed my mind and I knew I needed to be her for one of my costume parties. Well, dress up like her. Black tank, black pants (ideally leather), gloves, wristband, black hair, ankh necklace, and done. Boots - Already owned, but I just bought them from Target recently. They're sufficiently strappy for Death. Belt - Already owned, but I spotted a perfect one at Target the other night. Wrist gauntlets - I bought one at Hot Topic, and I wore my Jayne Cobb replica wristband on the other arm. Ankh necklace - Made from silver polymer clay about two hours before the party. Wig - Borrowed from a friend. It's not quite the right style, but it was better than finding and paying for a new one. Make-up - The white paint is alabaster pancake make-up applied with a sponge (don't forget your ears) and sealed with KY Jelly. I used a black eyeliner pencil on my eyes and eyebrows, liquid eyeliner for the Eye of Horus under the right eye, and black lipstick that I carefully applied with a tiny brush. I didn't want to carry an umbrella, but I've seen lacy ones at Michael's in the wedding aisle. You'd just have to spray paint it. 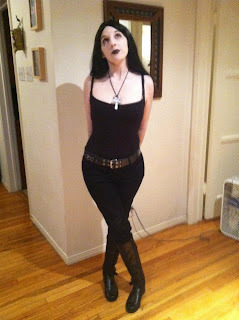 I'd fix a few things for next time - mostly the wig and better make-up application on my arms, but really, I'd love to be Death again. Repeatedly. While I was searching for a wristband at Hot Topic, a blue tutu with stars caught my eye. It was part of a display for superhero bustiers and hot pants. Though I was tempted to buy the tutu, I resisted. I couldn't resist the Wonder Woman bustier though. I picked it up knowing I would wear it eventually or just around the house (and be entirely happy about it). Then I walked by Forever 21 and saw a bright blue blazer ( that again, is something I'd wear as part of my regular wardrobe) and it clicked. I could be hipster Wonder Woman. I just added skinny jeans, heels, a messy bun, and glasses. 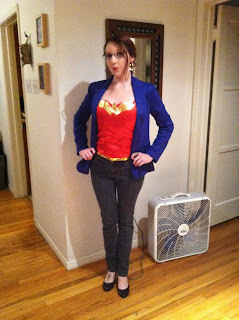 And now I sort of want to put together a hipster superhero cosplay group for San Diego next year. These are both awesome! I've always wanted to do Death...it'll happen someday. This year my costume is the Young Justice version of Robin. My roommate is being a sort of princessed-up Harley Quinn (her outfit looks like a cross between Harley and the Queen from the Royal Flush Gang). Haha, hipster superhero group cosplay. I'd love to see that! Your Death costume looks fantastic, you even have pose down. These both turned out awesome! Especially love the hipster WW, that just cracks me up. :) I've had an old family friend visiting all weekend (she's basically an aunt to me) and so I haven't done any parties, but I did pull out my old Disney Alice in Wonderland dress for a work party on Friday. :) Tonight I'm just gonna enjoy seeing all the kids come by! Well done, I especially like the Death look. One of my favorite comic characters as well. Thanks for the kind words, everyone. 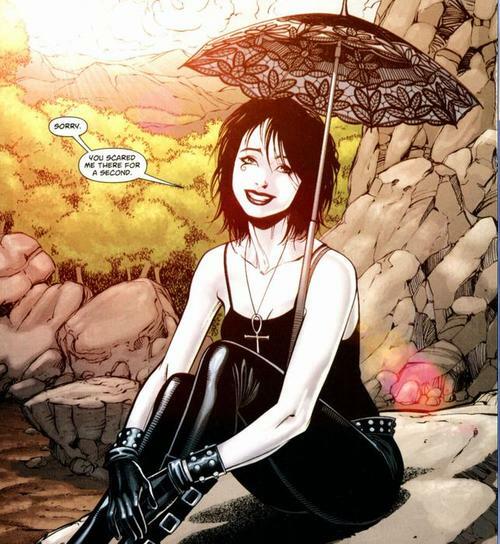 Death is near the top of my favorite costumes I've worn list. She's second only to Han Solo.